Well, it’s November and I’m kicking off two big projects: my handwritten note a day, and my first pseudo-NaNoWriMo. Oi! 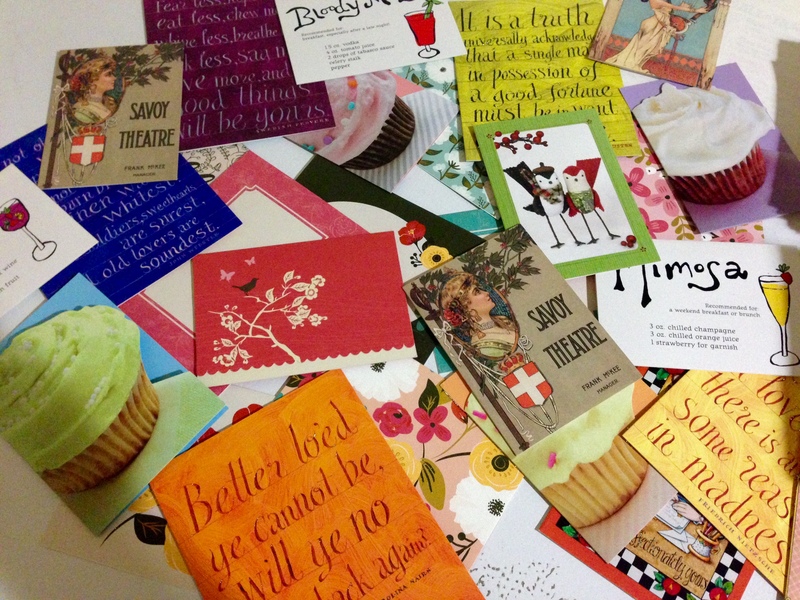 A quick survey of my stationary collection reveals that I could send thirty different cards–which includes variations on the same card; for example, four different cupcake cards!–to thirty different people probably twice over. I figured I’d have to send a duplicate here or there but, nope. So, with my stockpile sorted and no need to run out to buy more, we’re off! I wrote my first card to my sister. It was a postcard I made and then forgot to take a photo of before I dropped it in the mail yesterday afternoon… Whoops. When I woke up yesterday morning, I turned on my (brand new) laptop and started writing. I’ve had this story idea in me for a few years now–I even started jotting down some bits and pieces here and there–but I never really made a go of it. So I decided today that I would work on that. I wrote for some of the morning (today I may “time myself”; I want to see how much time it actually takes for me to do it so I have an estimation of my day) and then had to give up to get on with my day. One page and 575 words later, I really thought I’d written more…. But! At least it’s something down on (digital) paper. And like I already said: I’m not going to kick myself for not hitting 1,666 words per day; or 50,000 in the month. 575 words is–sadly–more than I’ve written in one sitting for the past three years, excluding press releases, letters and other work-related items, so I’ll take it as a win!